Who is Dr. Paul M. Muchinsky ? Dr. Paul M. Muchinsky (1947-2015) was one of the prominent collectors of sports pinback buttons and other sports memorabilia in the United States. He strove not only to enjoy the hobby, but to entertain and enlighten his fellow enthusiasts. A college professor and author of the best-selling textbook in the history of his field Psychology Applied to Work, he also penned two books on the hobby: Baseball Pinback Buttons and Boxing Pinback Buttons. [Email us to order the books]. He also blogged extensively about the hobby and was considered a definitive resource on the prices of pinback buttons. What is the Paul M. Muchinsky Collection? The Paul M. Muchinsky Collection as showcased on this website is comprised of the sports pinback buttons placed in trust by Dr. Muchinsky for the benefit of his grandchildren. Dr. Muchinsky wanted to continue to disseminate his knowledge of the hobby even after his death. Though he considered writing another book or revising his existing works, he came to believe that the Internet was the ideal medium to fulfill this objective. This website is a tribute to him and his life’s work, and offers an opportunity for his fellow hobbyists to search, research, or merely browse the Collection – as well as read his archived blog posts on the subject. Hobbyists are also welcome to use the website as a forum to communicate with each other. Why are many of the buttons in his books are not displayed here? In the final years of his life, Dr. Muchinsky sold or donated the vast majority of his memorabilia. He only retained what he considered to be the finest pieces in his collection. Are items in the Collection for sale? No. Dr. Muchinsky directed that the Collection not be sold until his youngest grandchild reaches the age of 22, at which time it is to be auctioned though the most efficient means then available. Thus, the earliest date on which the Collection may be auctioned is October 2037. Prior to that date, discretion was extended to the Trustee to consider only the following offers: 1) those to purchase of all items of a particular sport; and 2) those to purchase of the entire Collection. The minimum sale prices were directed by Dr. Muchinsky and determined based on his assessment of what the Collection will be worth in 2037. He was optimistic about its future value, and as such did not expect any of the Collection to be sold prior to the date set for the auction. Neither does the Trustee. Dr. Muchinsky selected the private, secure, climate-controlled location where the Collection will remain untouched until the auction. Are Dr. Muchinsky’s books available for purchase? Yes. After years of refusing to sell them outside of the trade shows he attended in person, the Trust has been authorized to sell the existing inventory of both books exclusively through this website. The price is $100 per book (which includes shipping), with all proceeds going to the costs of maintaining this website. Please send an email request to muchinskycollection@gmail.com to purchase books. Any inquiries related to the Collection or this website should be directed to Brian Muchinsky at muchinskycollection@gmail.com. Baseball in America has always been a popular pastime, especially in the first three decades of the 20th century. In addition to the Major League teams, there was a vast network of minor league teams. Many municipalities had city leagues where amateur baseball was played. But not all baseball fields had scoreboards. Fans would typically keep score by writing on a program. By the turn of the century someone invented a hand-scorer. It was made of plastic and consisted of three small wheels that could be turned to reveal the inning, the score for the home team, and the score for the visiting team. The reverse side would contain an advertisement for some produce or service. As such, these scorers provided a new way of marketing. A related baseball item was a mirror, and presented on the reverse side was a team’s schedule for the season. Scorers and schedules came in different shapes. Today it is unusual to find these items in pristine condition, as either the mirror became cracked or the scorer is no longer operable. In the early years of the 20th century baseball medallions were given to participants in a tournament or as a prize for winning the game. Pins featuring a “crossed bat” design are among the most iconic of all baseball pinback buttons. They were first issued in the early 1930s up through the 1960s. They were made in three sizes: 1.25”, 1.75”, and 3.00”. A more detailed discussion of these pins can be found in the July 28, 2013 column of baseballpinbackbuttons.wordpress.com. Among the most popular baseball pins are those featuring a player. They were sold at Major League ballparks and by vendors outside the ballpark. They typically came in two sizes: 1.75” and 2.125”. No one knows the maker of these pins (especially the smaller size), nor the complete list of players who had pins made of them. Even 70 years after their issuance, previously unknown pins turn up in the hobby. There are fewer players in the large size than the smaller size. Player pins were first made in the 1930s and continued through the 1960s. Only recently was the maker of most of the larger pins discovered. 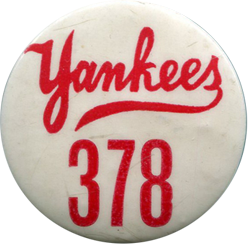 The story behind these pins was presented in the March 7 and March 13, 2015 columns of baseballpinbackbuttons.wordpress.com. Items pertaining to the two Dempsey-Tunney fights were discussed in the March 26, 2013 column of baseballpinbackbuttons.wordpress.com. The baseball All-Star game was first played in 1933. These pins were sold to fans only on the day of the game and only in the city where the All-Star game was hosted.